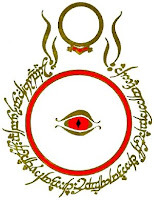 One Eternal Day: "If all died who warrant punishment..."
The Lord of the Rings was not a self-consciously Christian work in the beginning, Tolkien confessed, but it increasingly became such during his many revisions of it. "It is about God," he added, "and His sole right to divine honour." Life within a cosmos that is the Creator's utter gift should elicit proper praise and worship of God. 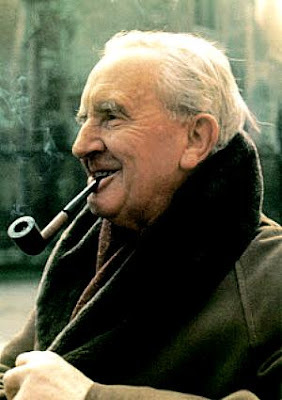 As a thoroughgoing Augustinian, Tolkien held that such homage enables the accomplishment of our fundamental life-task: the setting of our desires and loves in right order, honouring God above all else, and thus loving all other realities according to their relatively subordinate worth. It is just such honour that the rebel vala named Melkor refused to grant Iluvatar, the divine Creator. In an act of proud rebellion akin to Lucifer's own revolt against Yahweh, Melkor sought his own autonomy, thus ruining the cosmic harmony as Iluvatar had orchestrated it. Before he was finally defeated, Melkor (renamed Morgoth, or "the Dark Enemy") recruited a maia named Sauron ("the Abominable") to his cause. Precisely in the unlikely heroism of the small but doughty does Tolkien's pre-Christian world become most Christian and joyful. Whether in the ancient Nordic and Germanic, or else in the Greek and Roman worlds, only the strong and extraordinary are capable of heroism. The great man stands apart from his mediocre kith. He outdistances them in every way, whether in courage or knowledge. The animating power of this Company is the much-maligned virtue called pity. It is a word that has come to have malodorous connotations, as if it entailed a certain condescension toward its recipients — as if the one who grants pity stands above them in moral and spiritual superiority. Knowing well that pity was the quality that Nietzsche most despised in Christianity, but also that the word derives from the antique Roman elevation of pietas as a fundamental reverence toward everything to which we owe our lives, Tolkien transforms the term into the epic's chief virtue. "Pity? It was pity that stayed his hand. Pity, and Mercy: not to strike without need. And he has been well rewarded, Frodo. Be sure that [Bilbo] took so little hurt from the evil, and escaped in the end, because he began his ownership of the Ring so. With Pity." "I am sorry, "said Frodo. "But ... I do not feel any pity for Gollum ... He deserves death." "Deserves it! I daresay he does," [replies Gandalf]. "Many that live deserve death. And some that die deserve life. Can you give it to them? Then do not be too eager to deal out death in judgement ... [T]he pity of Bilbo will rule the fate of many - yours not least."